Located near the intersection of W Thornton Pkwy and Huron St, Extra Space Storage serves residents of Thornton, Northglenn, Westminster, Welby, Sherrelwood, Federal Heights, and more. Locals will recognize our facility east of Valero and Western Convenience Store. 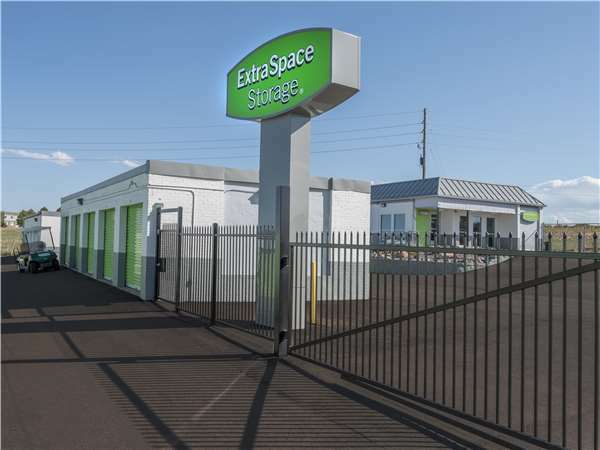 Extra Space Storage on W Thornton Pkwy offers a variety of storage units, vehicle storage, and exceptional security. We're the convenient storage partner for you in Thornton! Our Thornton storage facility has unit sizes as small as 5x5 and as large as 20x30 with features like drive-up access. Whether your storage needs are residential or commercial, we have the perfect space for you! With advanced security measures like 24-hour video surveillance and electronic gate access, you can rest assured your valuable belongings are well-protected at Extra Space Storage. Need to store a vehicle in Thornton? Extra Space Storage offers 10x20 to 20x30 enclosed drive-up units and 10x20 to 10x40 outdoor parking spaces to accommodate boats, RVs, cars, and motorcycles. Not only does Extra Space Storage provide reliable self storage in a clean, secure facility, but we also have the best customer service in the business! Our friendly, professional staff goes the extra mile to ensure your needs are met and that you have a great experience with us. Contact us today to reserve a storage unit in Thornton! I am happy to be hear. If what you need is not available, wait, they will make it happen. I was going through a tough time, and Brian and Gina took me in and walked me through the process, helping ease my mind with storing my things at this location to start fresh in life. Thank you Brian and Gina. The facility is well taken care of. The customer service is fantastic and the process was easy. Wish all businesses were like this. The manager is so friendly and helpful! The folks at Extra Space Storage have been very friendly and helpful to work with, and I feel safe storing my items in my unit as it's climate controlled and not subject to the harsh elements outside. Even my candles are safe from melting in the summer heat! Very friendly and informative staff, I highly recommend this Storage place. Extra Space Storage was very informative and super friendly! Brian made sure I knew where my unit was and made sure my code worked before I moved my stuff in. His attitude was awesome and he was very helpful! I would recommend Extra Space Storage to anyone looking for storage units, it truly was a great experience! Brian and Max were very friendly and extremely helpful. They were able to answer all my questions and show me the site that was available. I would highly recommend them. I am very satisfies with the employees customer services. It is at a very convience location easy access to the hwy and all the other main streets. The place is very secure and clean. The employees are so helpful and nice and help you find something that works for you. Happy that it's so close to where we live too. The staff at Extra Space Storage on Thornton Parkway is excellent. I have had a small unit for a few years and just upgraded to a larger one. I always get my questions answered quickly and they go above and beyond to make sure my storage needs are met. I've been in this facility for a few months and love it, Very easy to get in and out of. Very friendly in the office. I really like how well the units are sealed to keep out dust and dirt. I would highly recommend this facility. The place is great place for a business storage. We have other place but like to move all to this place. Keep up the good work. The office personnel at the facility on Thornton Pkwy was very helpful and friendly. She was very knowledgeable and took the time to answer all of our questions. Facility is readily accessible and well maintained. I rented 4 10 x30 units, I never received the first month free on any of the units. One unit, I did receive half off, because I had already rented 2 units within, 15 days. There seems to be some mixed signals as to what your Company supplies to the public, and at what price ? The employees are nice and polite. They will call and E mail you concerning anything securtiy or if you are late on a payment. I have not seen this with any other storage company. I am glad to have found this place to put extra storage. Kim is a very nice young lady and works very well with her costumers. She is very pleasant to talk to and I like to stop by just to talk to when she is not busy. i was greated with a very heartfelt hello and smile.. the personnell are wonderful and made a wonderful impression on me..i would reccomend this facility to any of my friends..
Just a heads up.....Charles B. couldn't have been of more help the day I had to rent a space at this location. Excellent customer service, and he actually went above and beyond my expectations. He truly helped me out. Thanks Charles! Every time i come to pay my bill Kim always remembers my name. That doesn't happem often and i very much appreciate it. GREAT CUSTOMER SERVICE!! I have been a customer here for over a year now and Kim is always wonderful. When ever im in and out Kim is usually cleaning up around the lot and its very nice! I came in with my dad to rent a spot for his boat. we talked to a few other storage facilitys in the area and kims customer service not only solved alot of our problems it was so inviting we chose to stay with xtra space.Thank you,kim p.s you went above and beyond and i appreciate it!!! I came in looking for a 5x10 and Kim showed me the property and the unit, it was very nice to have someone help me find exactly what I was looking for. Thank you so much! We have been customers a little over a year, we started with them because they had good prices. But since we have been there they have raised the price 2 times without any explanation. I think it is quite ridiculous cause they are outside units and it is nothing fancy. So needless to say we will be looking for a different location. MY husband has been a customer for almost a year and has always said great things.I became a customer as well and was treated very well it was overall a great experiance. The storage facility is well managed and maintained with a great location and prices for a storage unit. I have no complaints about the facility. Kim is the epitomy of perfect customer servant. She was cheerful, patient with my questions and unbelievably thorough! This gal is worth every dime you pay her! When I moved to the area, I was going to rent from another company. They were quite rude and the facility was dirty. I came to this facility and was very pleased with the excellent customer service and cleanliness. I have been extremely satisfied with renting a storage unit here. The few times I have had a problem, the onsite manager was very helpful and bent over backwards to help me. The security is top of the line and I feel my stuff is safe. The pathways are always cleared very quickly after a snowstorm and I have never had a problem getting to my storage space. I also love the convenience of being able to pay my rental fee online. Alwals Friendly, Helpful, look foward to coming in and paying my monthly bill. love It! Drive south on I-25. Pass Walmart and continue straight. Take exit 220 and follow signs for Water World. Our facility will be on the left after Conifer Rd. Drive north on I-25. Take exit 220 and turn left onto Thornton Pkwy. Our facility will be on the left after Conifer Rd. Drive west on Thornton Pkwy. Pass Washington St and continue straight. Cross I-25 and continue straight. Our facility will be on the left after Conifer Rd. Drive east on W 92nd Ave. Cross Denver Boulder Turnpike and continue straight. Our facility will be on the right after Huron St.